Carl Sagan may have passed away almost twenty years ago, but he continues to influence minds of all generations through intellectual heirs like Neil DeGrasse Tyson (host of the remake of Sagan's beloved 1980 TV series Cosmos) as well as through the books he wrote in his lifetime. But what books influenced Sagan, launching him on the journey toward astronomy, cosmology, astrophysics, astrobiology, and global celebrity? 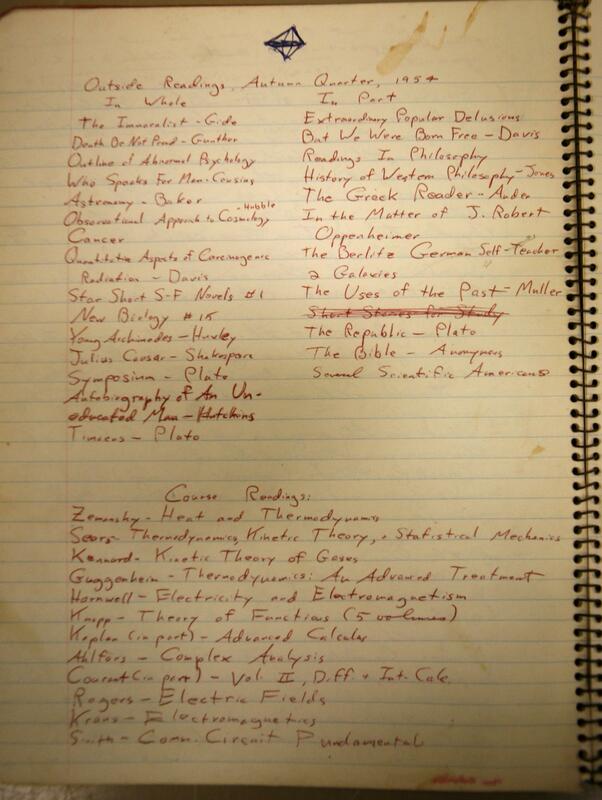 Thanks to the Library of Congress' Carl Sagan Archive, we now know at least forty titles from the no doubt voluminous amount of reading material he digested during his youth and education. Pretty ambitious material for a twenty-year-old, but remember: we're talking about someone who, around a decade earlier, had already sketched out his ideas for humanity's spacefaring future. It makes sense that such a child would grow up to read science fiction — and with the publication of Contact thirty years after that, write it — and even that he would take up mathematics and physics as a course of academic study. But it takes a mind like Sagan's not to lose sight of the importance of communicating with the nonspecialist public, as evidenced by the presence on his list of Scientific American and Extraordinary Popular Delusions. Nor did he neglect, even before his career began, the need to contextualize scientific discoveries in the realm of human thought and feeling, which extends from Plato and the Bible to Shakespeare, André Gide, and John Gunther — that last writer's work, and certain other volumes on his list, also showing an advanced consciousness of human limitations and mortality. All of it placed Sagan well, despite his truncated time on Earth, to do work that will outlast us all.